HP's new fleet of business tablets includes a giganto 12-inch Android slate with a stylus that can write on screen and paper with equal ease. While the tablet's size draws attention—and heads off any potential iPad Pro at the pass—the stylus is the real story here. I just tried it out, and it's legitimately awesome. HP's new "Duet Pen" stylus works with its new Pro Slates of both the 8 and 12 inch varieties, and instead of being a touch-based stylus like you might be used to, it works by sending out an ultrasonic scream. The tablets have 4 microphones—on at each corner—that listen for this scream and let them locate the pen. This is Qualcomm tech that's been around since 2011, but hadn't found a consumer-facing home until now. When you're using it on the tablet's screen, it's a lot like using any ol' touch-based stylus. But! If you don't want to write on the screen, those ultrasonic tricks let you write on paper that's next to the screen, which gets then gets transferred to your tablet in real time. You're not just stabbing at the paper with a rubber nub, either; Duet Pen has a swappable point with a plastic screen-friendly bit on one end, and a traditional ink pen tip on the other. It's an ingenious little trick. And even when your battery-powered stylus dies (it charges by microUSB for a battery life HP says is around a week), the pen will still write as long as it has ink. The back and forth between display and legal pad is managed by HP's app, in which you can switch from "tablet mode" to "paper mode" (the tablet is unfortunately not smart enough to figure out where you are writing on its own) and doodle away. As you draw on the paper, the tablet plays copycat like there's another, invisible stylus mirroring your every move. It's dope. From everything I saw, the tech works flawlessly. Those ultrasonic bursts clearly have no trouble traversing a few inches in a loud room. And it should go without saying that writing on a pad of paper with an actual pen is leaps and bounds more satisfying than writing on any screen with any stylus. Period. 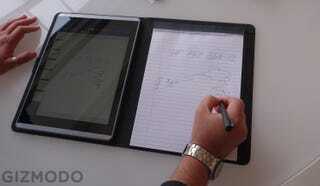 The best way to write on a tablet is to not have to. With rumors mounting that Apple will be coming out with a similarly large iPad and a stylus of its own, HP is clearly getting out ahead of the Cupertino. But more important than being first, I can't imagine a more seamless and simple way to bring pen-and-paper writing to a tablet. No, the specs here—especially on the big tablet—are not mind-blowing. But stylus-wise, this is a tough act to beat. The pair start at $450 (8-inch) and $570 (12-inch) and are available from HP starting today.